Located 2nd row to the best beach on Hilton Head Island (as featured in Hilton Head magazine). This southern-style beach house has a large porch with rockers and a swing to relax. It provides a private, heated pool and adjoining hot tub with lounge chairs for sun bathing. The kidney-shaped pool is surrounded by palms and overhanging live oak trees. There is an outdoor shower available when returning from the beach for your personal use. The pool may be heated for an additional charge. Please inquire. It is minutes away from golf, tennis, shopping, and restaurants; yet its location at the end of a Cassina Lane in South Forest Beach affords peace and quiet with the sound of the ocean. It is perfect for two or more families vacationing together, with the two master bedrooms. On the main floor, the master bedroom has a King size bed with a brand new mattress, TV, private bath with deep tub and separate shower. Also on the main floor is a bedroom with two twin beds and a den/bedroom with a queen sized sleeper sofa. The den has a TV and shares a newly remodeled and upgraded bathroom with the twin bedroom. On the 2nd floor, there is a newly added master bedroom with a king-size bed, TV and a large master bath. Also on the 2nd floor is a bedroom with another king size bed and a brand new double pillow top mattress. The next room has two twin beds. They share a large bathroom with a tub/shower/toilet and two sinks. There is also a small bedroom with a trundle bed which converts to 2 twin beds. There is a bathroom adjoining it with with a toilet and vanity. The washer and dryer are on the 2nd floor. The living area is very open with two-story ceilings, and TV/VCR/DVD. The dining area is adjoining but separate with floor-to-ceiling windows overlooking the pool area. There is seating for ten plus two at the kitchen counter and four more at the window counter. The kitchen has been expanded with granite counter tops and a center island. There is a brand new french style refrigerator with plenty of room for food for an entire week. The kitchen is great for cooking large meals or just preparing snacks. There is under-house parking for two cars and space in the driveway for two more. Floor Plans Available in pdf. Please contact owner if interested. Our beach house is located less than a mile from the famous Van der Meer Tennis Complex and not far from Sea Pines or Palmetto Dunes Tennis Centers. Also, 38 golf courses are located on the island. There are 40 miles of bike paths, and the beach stretches for 12 miles. Coligny Circle is a short bike ride and provides many amenities including many restaurants, shops, and fun for the whole family. Visit Shelter Cove Harbour and Harbour Town for fine/casual dining and great shopping, or enjoy a play at the new Cultural Arts Center. Both are just a short ride from the South Forest Beach area. We also offer a discount on weekly bike rentals at Riding Tigers Bike Rentals. Please reserve your bikes 2 weeks ahead of your vacation. For more information please call 843-686-5833. Please Note: We only rent Saturday-Saturday during our peak months in June and July. One visit and you will discover why we love our 'home away from home. This is one of two houses that the Stratton Family has purchased for some family use and for rental. We manage the properties and rent them ourselves. Our renters save on the 30 percent fee that many of the management companies charge. We live in Marietta, Ga and travel to the properties regularly to keep the properties in tip top shape for the rental season. We have loved Hilton Head Island ever since my first visit there in 1980. We have been vacationing there on a regular basis ever since. We finally decided to buy a place and enjoy the island even more. We love that the location is private, you can hear the sound of the waves from the ocean at night. The beach is very close and is never crowded. The new renovations have made the house even better. Can see a section of the beach through the trees off the front deck. Can see a section of the ocean through the trees off the front deck. How is in good condition. We were 13 and fit pretty well. We cooked every night. Right off the beach. Nothing to complain about. House had everything we needed to be comfortable. Great location, spacious and comfortable! We had a group of eleven women spend 4 nights. The house was spacious and comfy in a great location! Very Cozy and Warm Place! 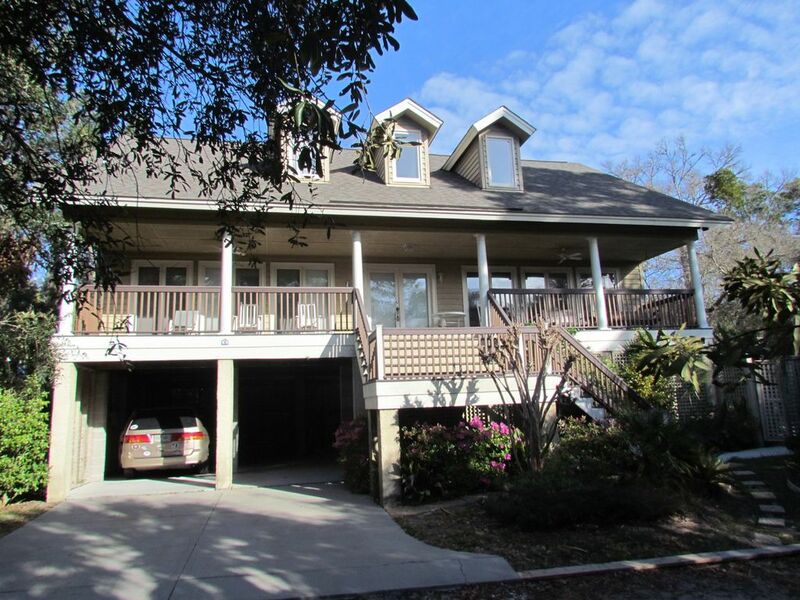 This is a great location with close proximity to the beach as well as a short walk to Coligny. We enjoyed our stay very much! We loved the porch, family room, and private pool!! We love being so close to the beach! We had ages 2 to 87. The kitchen was well supplied with dishes and pans; we cooked over half the time. So thankful for our time there. We all enjoyed sitting outside on that huge porch. What makes it so nice is, it is shaded and has ceiling fans so you always have a breeze. *The kitchen is well stocked with everything you could possibly need in a kitchen. * The pool with the spa was very nice, especially for the kids. * The owners are always available to answer questions. * Close proximity to the beach. About a 5 minute walk. * Bedrooms have plenty of USB ports for charging phone. We would definately consider staying there again. Please Note: Our change over day is Saturday but please contact us as we can be more flexible in our non-peak weeks. Rates include wifi and hot tub heat. Rates are subject to change until reservation is made. Pool Heat is extra, please ask owner. We also accept personal checks and PayPal payments.